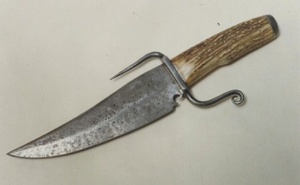 A colloquial reference to a Bowie knife, a fixed blade, as opposed to a switch blade, knife named after the infamous knifefighter Jim Bowie, who was killed at the Battle of the Alamo in Texas in 1836. Bowie knife by Tim Lively, March 2009, is licensed under CC BY-SA. 2004 The Bowie Knife: Unsheathing an American Legend. Lincoln, RI: Andrew Mowbray.